A few years ago I developed a bit of an obsession with wearing long-sleeved, solid colored, fitted, t-shirts. I have lots of perfectly good (in my own mind) reasons for this, including: comfort, cost, simplicity, laziness, signature, convenience, etc. I remember reading online about a guy who was a successful advertising exec (or something like that) in New York City and he recommended acquiring a “signature look” so people would remember you. His happened to be black shirts and he said that it got to the point that whenever he DIDN’T wear a black shirt…people he knew wouldn’t even recognize him because they were only expecting to see him in black. For some reason that has always stuck with me and helped me rationalize my obsession/behavior/actions. It started out innocently enough. 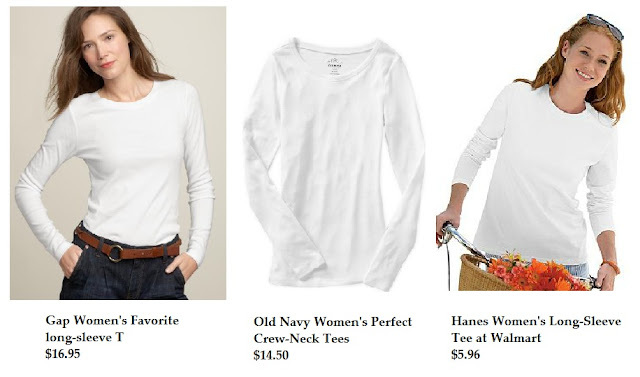 At first I would only buy the “best” crew neck Tee’s from The Gap in lots of different colors. Eventually I switched over to Old Navy’s Tee’s because they were cheaper and you could buy them in TALL sizes. (I hate shirts that are too short!) But the last couple of times I have purchased them, I’ve been disappointed. It seems like each time I order them they are made from a different type of fabric that becomes increasingly thinner and thinner with each order. So basically the quality of the shirts has gone down, while the price stays the same. My other frustration…the lack of colors. I end up ordering colors I really don’t like all that much (like puce) because they are the only ones available. So Saturday I was at the new Wal–Mart that just opened in town (yes, I live in a pretty small town, and yes, getting a Wal-Mart is a big deal here!) buying a wedding shower gift when I happened by the women’s long-sleeved T’s. They weren’t in a pretty display. They weren’t even hung on hangers. They were rolled up nice and tight and secured with a piece of plasticized paper that you couldn’t get off unless you were carrying a very sharp pair of scissors with you! The thing that first caught my eye was the wide array of colors! I think there were at least a dozen different really PRETTY colors! They I glanced at the price and had to do a double-take. $5.97?? REALLY? Well, I was intrigued but dubious to say the least. There had to be SOMETHING majorly lacking in these t’s to be so cheap. Since the packaging of them didn’t even allow me to see them beyond their tightly balled up state…I was pretty certain they couldn’t come close to my current Old Navy collection. But….at that price….I was willing to take a small gamble. I bought one in white and one in black. The picture below pretty much sums it up for me. 3 shirts….three very different prices….and yet, believe it or not, the Wal-mart one is by far my favorite of the 3! I couldn’t believe it. When I got them home and tried them on they were the right size, the right fit, the right length, the right fabric, the right neckline (I don’t like them too scoopy!) They only problem was I was kicking myself for not buying one in every color! :-) Something I am going to remedy this weekend. You’re probably scratching your head about now, wondering why I just devoted 4 paragraphs to my little apparel dilemma. Good question. Let’s just chalk it up to finding JOY in the LITTLE things in life. TWO Amazing "How-To" Videos = ONE Good Thing! I know quite a few people that work for Walmart, and they love working there. The unions have put it out there that Walmart treats their employees horrible because they won’t join the unions. With that being said….I buy a lot of clothes at WM. I am a single mom and need to save money wherever and whenever I can! I have a weird shaped body and their jeans fit perfectly! I usually gain weight before they wear out! Their t’s are super because they’re Hanes!